The kingdom of Rheged is probably the most elusive of all the sixth century kingdoms of Dark Age Britain. Despite contributing a rich source of some of the earliest medieval poetry to be composed in Britain – the poetry of Taliesin who extolled the prowess of its king, Urien of Rheged – and fragments of early medieval historical records of Urien’s dominance in southern Scotland and northern England, the actual location of Rheged has long been shrouded in mystery. While many historians have assumed it was centred around Carlisle and Cumbria, no evidence has ever been found to back this up. However, new archaeological evidence from the excavation of Trusty’s Hill Fort at Gatehouse of Fleet in Dumfries and Galloway now challenges this assumption. The excavation revealed in the decades around AD 600, the summit of the hill was fortified with a timber-laced stone rampart. Around the same time supplementary defences and enclosures were added to its lower-lying slopes transforming Trusty’s Hill into a nucleated fort, a type of fort in Scotland that has been recognised by archaeologists as high status settlements of the early medieval period. Anyone approaching the summit of Trusty’s Hill passed between a rock-cut basin on one flank and an outcrop on which two Pictish symbols were carved on the other. This formed a symbolic entranceway, a literal rite of passage, where rituals of royal inauguration were conducted. On entering the summit citadel one may have been greeted with the sight of the king’s hall at the highest part of the hill on the west side, where feasting took place, and the workshop of his master smith occupying a slightly lower area on the eastern side, where gold, silver, bronze and iron were worked into objects. The layout of this fort was complex, each element deliberately formed to exhibit the power and status of its household. Reconstruction of the royal stronghold atop Trusty’s Hill as it may have appeared c. AD 600. © DGNHAS / GUARD Archaeology Ltd. The excavation also found the remains of a workshop that was producing high status metalwork of gold, silver, bronze and iron. The royal household here was also part of a trade network that linked western Britain with Ireland and Continental Europe. In fact, research now shows that over the late sixth and early seventh centuries AD Gaulish merchants were making a beeline for the Galloway coast, ignoring Cumbria entirely. The excavation revealed that one of the reasons for this may have been to acquire materials like copper and lead. Isotope analysis of a lead ingot found during the excavation of Trusty’s Hill was found to have originated in the Leadhills of south-west Scotland, demonstrating that this mineral source was being mined and used to make leaded bronze objects at this time. Other activities apparent at Trusty’s Hill included the spinning of wool, preparation of leather and feasting. The diet of this early medieval household, with the predominant consumption of cattle over sheep and pigs, and oats and barley rather than wheat, was largely indistinguishable from their Iron Age ancestors. Anglo-saxon style bronze jewellery from Trusty’s Hill. Analysis showed that this was originally gilded and silvered and made of leaded brass quite distinct to the leaded bronze objects being made at the workshop here. It was probably brought to site as loot. © DGNHAS / GUARD Archaeology Ltd. It is in this context that the Pictish symbols at Trusty’s Hill can now be viewed. The new analysis of the symbols here leave no doubt that the symbols are genuine early medieval carvings, likely created by a local Briton, melding innovation, contacts with Atlantic Europe and deep seated traditions. The location of the symbols at the entranceway to the summit of Trusty’s Hill and opposite a rock-cut basin, mirrors the context of the inauguration stone at Dunadd, the royal centre for the kings of Dalriada, the early Scots kingdom that once covered what is now Argyll and Bute. The imported goods and production of fine metalwork at Trusty’s Hill is comparable in quality to Dunadd, showing that these two royal households were of equal status. Dunadd’s Pictish boar, footprint, ogham and rock-cut basin at the entrance to the summit enclosure are best viewed as a set of royal regalia where the rituals of inauguration took place. 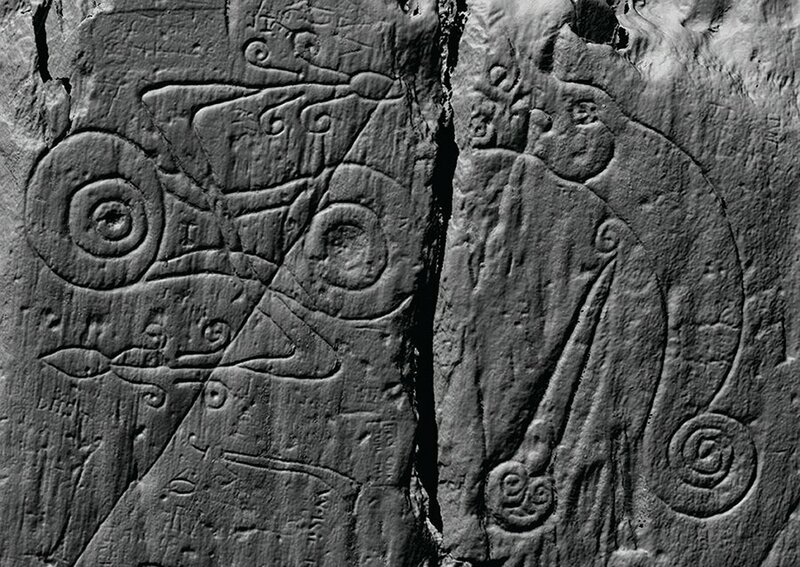 The only other Pictish carvings located outside Pictland were found near Edinburgh Castle Rock; another site attested by archaeological and historical evidence to be a royal stronghold of the sixth to early seventh centuries AD. Close comparisons can also now be drawn with the early sixth century royal site at Rhynie in the heart of what was once Pictland. The 2012 excavation at Trusty’s Hill sought to reveal the archaeological context for the Pictish style carvings. They succeeded in showing that the site was very likely a royal stronghold and place of inauguration of the local Britons of Galloway. Redrawing the map of Dark Age Britain. The new map of Rheged and its neighbouring kingdoms during the sixth and early seventh centuries AD. © DGNHAS / GUARD Archaeology Ltd.
A cluster of contemporary Dark Age sites, such as Whithorn, Kirkmadrine and the Mote of Mark, is now known in Galloway. Trusty’s Hill is the only one of these where there is evidence of royal inauguration and suggests that this site was at the apex of a local social hierarchy. The new evidence from Trusty’s Hill now provides a political context to the wealth and complexity of Galloway during the sixth century, the attraction of the region to continental merchants, and Galloway’s claim as the cradle of Christianity in Scotland. The archaeological record for the establishment of Christianity in southern Scotland suggests that its elite communities were literate and well connected internationally. This could not have occurred without a powerful secular presence providing land and resources. With the corroboration of the literary, historical and archaeological evidence, we begin to see the tantalising clues to a vibrant and dynamic culture that is entirely consistent with Rheged, a kingdom that was pre-eminent in northern Britain in the later sixth century but which faded into obscurity through the course of the seventh century. The deliberate and spectacular destruction of Trusty’s Hill and the nearby contemporary fort at the Mote of Mark in the seventh century AD, which can also be surmised for a number of similar forts in Galloway, is a visceral reminder that the demise of this kingdom in the early seventh century AD came with sword and flame. The Lost Dark Age Kingdom of Rheged by Ronan Toolis and Christopher Bowles is published by Oxbow Books. For more information visit the Galloway Picts website.